OK this one has Dave written all over it and may get me back on my Koga fixed gear more often. Swiss menswear designer Strellson teamed up with Bianchi and created a limited edition clothing collection that looks good in the board room and is comfortable enough to ride on the boards of the velodrome. The collection is all black and white, so it is ideal for men who are intimidated by fashion choices and afraid of pattern. You can mix and match pieces like Garanimals for grown ups. Unfortunately, like inexpensive healthcare, I think the closest place to get a Strellson hook-up is in Canada. The centerpiece in the collection is a slim-cut black suit made from a stretchy fabric that repels water and dirt. The cuffs and collars have reflective tape underneath that is visible when you roll the pant leg. There is also a waterproof, breathable jacket with a hood. At $795 for the suit and $395 for the jacket, these are out of my price range, but no more expensive than any other off the rack designer suit you might find at a good menswear store. There is also a white dress shirt, crew neck, courier bag, stretchy belt and some other pieces all made of technical bike friendly fabrics. For those who like logos, there are discreet Bianchi and Strellson logos on the outfits. 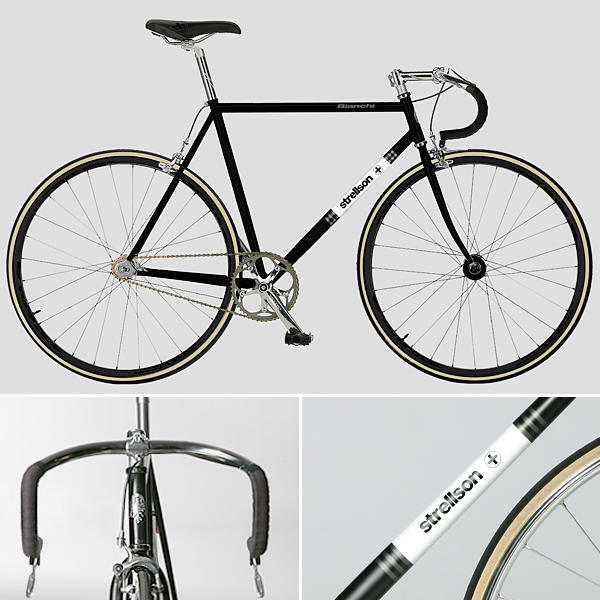 It is not too late to get one of the limited edition Bianchi fixies. They sell for about $1,900 US, but I think you would have to import one. You can get one on the Strellson webstore here or you could ask Vince at Bens Cycle if his Bianchi rep could get one. Strellson wants to know what you think. Let them know on their Facebook page. I will stick with my chords for winter and my department store slacks for winter commuting. It will leave me with more money to spend on bikes. Anyway I could never be as suave or look as cool as Dave! Nice threads! I should get some for riding my prized ’70s Cilo! That would be enough to make Michael Ronkin jealous. No kidding! We’ve talked about Cilos through the years. As a Swiss guy, he’s got a thang about these bikes.